Greenlight Entertainment is very sensitive to the nature of wedding ceremony and receptions and works very hard to ensure a memorable occasion for the bride and groom and their family and friends. The client is asked to provide input early in the planning stages to create the timeline, select appropriate songs, and choose any lighting. Included in all wedding packages are two in-home planning sessions, where a Greenlight Entertainment DJ personally meets with the client to provide a level of comfort and an opportunity to finalize all details. 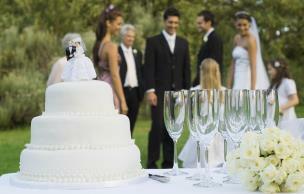 For wedding receptions, emcee and coordination services are standard. The DJ will act as master of ceremonies, introducing the bridal party as well as bride and groom to kick off the reception. Throughout the evening, he will steer the reception by making the various appropriate announcements for the bride and groom's special dances, such as first dance, parent's dances, cake and bouquet toss/garter removal and toss. The DJ will also interface with your other reception vendors, such as photographer, videographer and venue staff to ensure everyone is coordinated and in place for each milestone event of the evening.